Just when we were beginning to think the media had finally learned to tell a hawk from a handsaw when covering global warming (at least when the wind blows southerly), along comes this article ‘In Ancient Fossils, Seeds of a New Debate on Warming’ by the New York Times’ William Broad. This article is far from the standard of excellence in reporting we have come to expect from the Times. We sincerely hope it’s an aberration, and not indicative of the best Mr. Broad has to offer. Broad’s article deals with the implications of research on climate change over the broad sweep of the Phanerozoic — the past half billion years of Earth history during which fossil animals and plants are found. The past two million years (the Pleistocene and Holocene) are a subdivision of the Phanerozoic, but the focus of the article is on the earlier part of the era. Evidently, what prompts this article is the amount of attention being given to paleoclimate data in the forthcoming AR4 report of the IPCC. The article manages to give the impression that the implications of deep-time paleoclimate haven’t previously been taken into account in thinking about the mechanisms of climate change, whereas in fact this has been a central preoccupation of the field for decades. It’s not even true that this is the first time the IPCC report has made use of paleoclimate data; references to past climates can be found many places in the Third Assessment Report. What is new is that paleoclimate finally gets a chapter of its own (but one that, understandably, concentrates more on the well-documented Pleistocene than on deep time). The worst fault of the article, though, is that it leaves the reader with the impression that there is something in the deep time Phanerozoic climate record that fundamentally challenges the physics linking planetary temperature to CO2. This is utterly false, and deeply misleading. The Phanerozoic does pose puzzles, and there’s something going on there we plainly don’t understand. However, the shortcomings of understanding are not of a nature as to seriously challenge the CO2.-climate connection as it plays out at present and in the next few centuries. The use of the more recent Pleistocene and Holocene record to directly test climate sensitivity presents severe enough difficulties (discussed, for example, here), but the difficulties of using deep-time Phanerozoic reconstructions for this purpose make the Pleistocene look like childs’ play. The chief difficulty is that our knowledge of what the CO2. levels actually were in the distant past is exceedingly poor. This situation contrasts with the past million years or so, during which we have accurate CO2. reconstructions from ancient air trapped in the Antarctic ice. Obviously, if you don’t know much about how CO2. is changing, you are poorly placed to infer its influence on climate, even if you know the climate perfectly and nothing else is going on besides variation of CO2.. But, neither of these latter two conditions are true either. Our knowledge of climates of the distant past is sketchy at best. Even for the comparatively well-characterized climates of the past 60 million years, there have been substantial recent revisions to the estimates of both tropical (Pearson et al., Nature 2001) and polar (Sluijs et al, Nature 2006) climates. Most importantly, one must recognize that while CO2. and other greenhouse gases are a major determinant of climate, they are far from the only determinant, and the farther back in time one goes, the more one must contend with confounding influences which muddy the picture of causality. For example, over time scales of hundreds of millions of years, continental drift radically affects climate by altering the amount of polar land on which ice sheets can form, and by altering the configuration of ocean basins and the corresponding ocean circulation patterns. This affects the deep-time climate and can obscure the CO2-climate connection (see Donnadieu, Pierrehumbert, Jacob and Fluteau, EPSL 2006), but continental drift plays no role whatsoever in determining climate changes over the next few centuries. Let’s take a closer look at the question of CO2 variations over deep time. In contrast to the situation for the late Pleistocene, there is no one method for reconstructing CO2 at earlier times which is fully satisfactory. Methods range from looking at carbon isotopes in microfossils to looking at the density of pores on fossil leaves, with many other exotic geochemical tracers (e.g Boron) coming in in recent times. There is also some data for the very early Earth associated with the CO2 conditions under which certain exotic minerals (uraninites and siderites) form. None of the methods is unambiguous, and none provide information about other greenhouse gases that might be playing a role (though there may be some hope to do something abou methane). 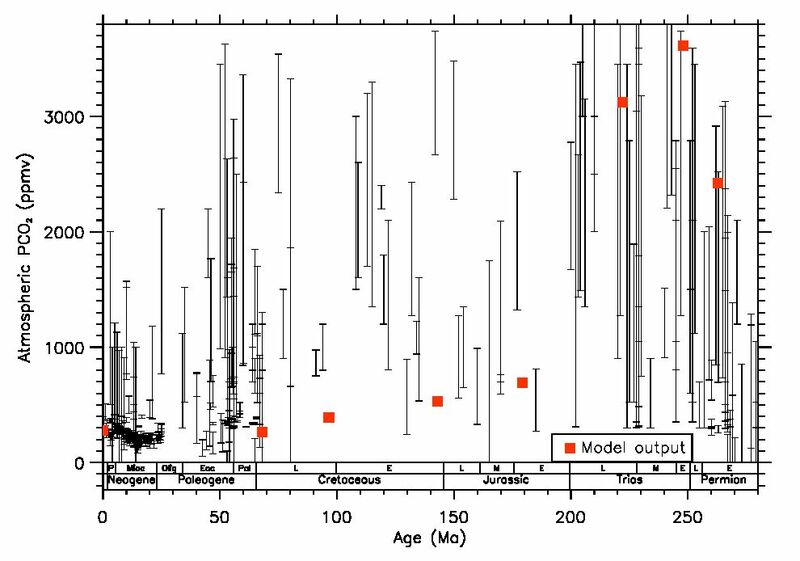 As an example of the difficulty faced by the field, take a look at the compilation of various estimates of CO2 since the Permian presented in the following figure (From Donnadieu et al, G3, in press; the red squares come from an attempted geochemical model fit to the data. The data set comes from Royer et al. (2004) and is available here). By the time one gets back to the Permian, the error bars are huge. At earlier times, the estimates are even more problematic. Broad’s article does make reference to a very interesting paper by MIT’s Dan Rothman, writing in PNAS. This paper attempts a peek at the CO2 over the past 500 million years, using a clever and novel reconstruction technique. It is innovative, but far from the last word on the subject. Broad inappropriately cherry-picks Rothman’s statement that there appears to be no clear connection between warm climates and CO2 (except in "recent" times, about which more anon). However, Broad’s article neglects all the caveats in the paper, which clearly point to the real problem being that the reconstructions of CO2 and climate over such time scales are so uncertain that it’s not clear that the data is up to the task of teasing out ssuch a connection. Even in Rothman’s reconstruction, during the past 50 milllion years — when the data is best and continents are most like the present — the long term cooling trend leading into the Pleistocene is clearly associated with a long term CO2 decline. This is not our main reason to infer that increasing CO2 will warm the climate in the future, but insofar as the data supports CO2 decline as a main culprit in the long slide from the Cretaceous hothouse climates of 60 million years ago to the cold Pleistocene climate, it also lends weight to the notion that as industrial activity busily restores CO2 to levels approaching those of the Cretaceous, climate is likely to turn the climate clock back 60 million years as well. From Broad’s flip dismissal of the CO2-climate connection in the "recent" part of the record, the reader would never guess at the length and particular significance of this period. And then, too, the tired old beast of Galactic Cosmic Rays (GCR) raises its hoary head in Broad’s article. The GCR issue has been extensively discussed elsewhere on RealClimate (e.g. here and here) On one level the GCR idea is another instance of the problem that Phanerozoic climate variations may have had many causes, giving rise to a false appearance of decorrelation between climate and CO2. Whatever role GCR may have played in deep time climate, the climate of the past century and its attribution to CO2 is a wholly different kettle of fish, since in modern times we have direct observations of GCR and they are not doing anything of a sort that would cause the observed warming — to say nothing of the fact that one would still have to argue away the basic radiative physics which makes CO2 affect the planet’s radiation budget. We repeat: There has been no recent trend in cosmic rays that could conceivably account for the recent warming, even if the GCR proponents were right about the physical mechanism underpinning their theory. This is made abundantly clear in this recently published article. Further, whatever was going on in the past, the present observations do not support the supposed cloud-GCR connection that is supposed to mediate the climate effect. That’s not the end of the story, for there are also severe methodological difficulties in the way the GCR proponents have attributed Phanerozoic change to GCR rather than CO2, and also severe conceptual difficulties in the supposed physical link between clouds and GCR.. Some of these difficulties may ultimately be resolved and allow a more fair test of the possibility that GCR influences played some role in the past. Surely, the play given to Veizer and Shaviv in the context of Broad’s article is an instance of false balance of the worst sort. The possibility that the GCR theory may play some role in deep-time Phanerozoic climate is eminently worthy of further consideration, but the way its major proponents have used the theory in attempts to undermine forecasts of near-term warming is unjustified. Besides the broad-brush errors discussed above, Mr. Broad commits a number of lesser climatological faux pas, in areas where he really ought to know better. He refers to CO2 as "blocking sunlight" (whereas it’s actually thermal infrared which CO2 affects). He says that CO2 traps heat "in theory." This is a lot like saying that a bowling ball dropped from an airplane will fall to the ground "in theory." There is indeed a theory involved in both cases, but the use of the phrase gives a completely wrong picture of the certainty of the phenomenon. There is no more doubt about the heat-trapping effect of CO2 than there is about the physics that causes a bowling ball to fall. Broad also says that the greenhouse effect of CO2 "plateaus" at high levels. This is a botched attempt to describe the well-known logarithmic radiative forcing of CO2, incorporated in every climate model since the time of Arrhenius. There is no "plateau" where CO2 stops being important. Every time you double CO2, you get another 4 Watts per square meter of radiative forcing, so that the anticipated climate change between present CO2 and doubled CO2 is comparable to that between doubled CO2 and quadrupled CO2. In fact, as one goes to very high CO2 levels (comparable to the Early Earth), the radiative forcing starts to become more, rather than less, sensitive to each further doubling (something that can be inferred from the radiative forcing fits in Caldeira and Kasting’s 1992 paper in Nature). Let’s not lose sight, however, of the essential conundrum posed by Phanerozoic climate, particularly by the warm climates of the Cretaceous and Eocene. Current climate models do not reproduce the weak pole to equator gradients believed to characterize these climates, and have trouble warming up the polar climates enough to melt ice and eliminate continental winter without frying the tropics more than data seems to permit. Maybe there’s something wrong with the data, or maybe there are currently unknown amplification mechanisms that make the switch from a moderate Holocene type climate to a hothouse more catastrophically sensitive to CO2. This truly must give us pause as we contemplate the experiment of doubling CO2 in the next century. It’s certainly an experiment that would help to resolve some of the mysteries of Phanerozoic climate, but we’d on the whole prefer to see the mysteries resolved by improved studies of past climate instead. Update: See Tom Yulsman’s commentary on this post and the broader issues. I’ve seen a lot about how astronomical influences cause warming which triggers CO2 release from the oceans and increasing green space, but little or nothing about how cooling occurs in the presense of high CO2. The warming side is plausible but what about the cooling side? Yes, the oceans can start to absorb CO2 when they cool but doesn’t that only happen after the cooling starts? So, let me repeat, how does the cooling start? Please point me to the link. The corals reefs in the Caribbean are deteriorating. The researchers see correlation between high dust deposits and coral death and are looking for causation. Re #101: Go here, scroll down to the linked papers and read at least the first one. The short answer is orbital cycles, although inclination doesn’t appear to be significant. I’m not sure I completely followed everything in the paper, but it seems to be a variation of the standard Milankovitch explanation that uses a convenient, periodic skipping of one of two or two of three of the 40k cycles to arrive at the 100k cycle of deglaciation in the late Pleistocene. As an observer becoming deeply interested in climate change, I have just begun reading some of the excellent material in RealClimate. I recently entered into e-mail correspondence with David Smith (a well-regarded business journalist for Sunday Times, UK) chiding him gently for taking up a rather sceptical position on climate change without having any real grasp of the fundamentals. I think I made him realise how much industry lobbying and ‘cuckoo science’ is muddying the waters. Smith quoted a recent lecture by Lord Lawson, to which I replied ‘same old canards’! It is most important to have reliable sources and also people who can publicly counter the dross. On a specific point relating to comment 101, I recently came across William Ruddiman’s paper ‘Ice-Driven CO2 Feedback on Ice Volume’- Feb 2006, which I thought highly pertinent to this discussion. Would any expert care to comment? > how does the cooling start? On the geological time scale, rapid removal of the carbon dioxide, ending the “superwarm” period — the last good example took 60 thousand of years. See Lovelock generally on this. Same way we expect the current rapid excess CO2 spike to be removed — natural processes, as biology deals with the excess CO2. Nature 2000 Sep 28;407(6803):467. Comment on:. Nature. 2000 Sep 14;407(6801):171-4. 171-174; 2000) were not passed on to the News & Views author. Google Scholar will find more on how the planet has responded after previous rapid increases in CO2, although “rapid” in prehistory is extremely slow compared to the current rate of CO2 increase. So just because nature handled the natural CO2 extremes doesn’t serve as assurance that nature can respond 10x or 100x faster to handle human activity. >how does the cooling start? “… ocean has absorbed about one-third of the CO2 released from all human activities (emissions from fossil fuels, cement manufacturing, and land-use changes) from 1800 to 1994 (Sabine et al., 2004). “Over the next few millennia, the ocean is predicted to absorb approximately 90 percent of the CO2 emitted to the atmosphere, after atmospheric CO2 concentrations are stabilized. In the geologic past, the ocean has experienced periods of large fluctuations in ocean chemistry and circulation that undoubtedly led to alterations in ocean ecosystems, but the concern today is that the current rate of warming and acidification is probably much faster than experienced in the past, perhaps too fast for ecosystems to adapt to the changes. Re #105: It is very much convenient in the sense that explaining the shift in glacial cycle length (the mid-Pleistocene transition) has been the fundamental problem in attributing the glacial cycles to orbital variations. Huybers appears to have nailed it (although I’m not sure this is universally accepted as yet). The remaining problem is to figure out the exact feedback mechanism by which the relatively subtle orbital forcings (too weak to drive the glacial transitions directly) result in the observed climate shifts. Thanks, Hank. It seems most of those papers, except the last, seem to be dealing with extreme anoxic events on the Palaeocene-Eocene boundary. Admittedly, that may be where we are headed, but I would still put the odds of it to be rather slim. I’m looking for something more relevant to the Pleistocene era and the rather routine, albeit slow, dropping of CO2 levels at the end of the interglacials. Maybe I’m making too big a deal of this. My understanding is that as the ocean cools it can absorb more CO2 and that is one of the main reasons that CO2 levels drop at the end of the interglacials. My problem, however, is understanding how the cooling starts when the CO2 levels are high. Wouldn’t the high CO2 level, by itself, prevent cooling unless there was a rather large reduction in solar radiation? So the theory goes. Nevertheless, the Pleistocene ice age cycles do seem to parallel the inclination of the Earth’s orbit. My point was: “Is this a coincidence?” I doubt if it is a coincidence but I’m not sold on the GCR theory yet. If Huybers is right, then the rosy predictions about this interglacial coninuing for 50k years or so are wrong since they are basd on eccentricity not obliquity. Jim, search for “primary productivity” plus the geological eras you’re interested in. I’m not trying to answer your question, but to point to tools — if you’ll pick out some of the relevant science and ask questions about it, perhaps we can interest an expert* in answering questions. At least, the approach* has long been recommended by experts in getting information online, and I find it often productive. * How To Ask Questions The Smart Way. Eric Steven Raymond. RE: #110 – There is a theory, railed against  by many who frequent RC, that the closure of the Isthmus of Panama set into motion new oceanic modes of oscillation (we’re talking very long period ones, way longer than anything like the PDO or the more controversial / debated AMO). Who’s to say that the glacial – interglacial back and forth is not a very long wave oscillation at its heart, which does not in any way depend on the Sun, inclination, wobble, volcanoes / aerosols, etc? Re #111: Since all three influence climate, it’s necessary to take into account the combined effect. In any case, current thinking seems to be that we are now in for a very long inter-glacial due to the CO2 we have already added to the climate system. Re #110: Jim, I think the straightforward explanation for how the cooling begins is simply that the orbital cycles combine to reduce insolation, and feedbacks take over from there. If you look at some of those other Huybers papers you should also find a discussion of the uneven response to insolation of the northern and southern hemispheres, which is why the role of obliquity is so important. Also, I think there may be some confusion about obliquity vs. inclination. The former is the tilt of the axis relative to the orbital plane while the latter refers to changes in the Earth’s orbital plane relative to the ecliptic. If I understand it correctly inclination is considered unimportant compared to the other three Milankovitch orbital cycles (I assume because it has little variance or because the variance doesn’t have much effect) and so is hardly ever mentioned. BTW, while apparently there are yet two other orbital parameters (for a total of six), the other two are not deemd to be Milankovitch cycles since they have no effect on climate. Since I understand that even mentioning these two parameters always results in an argument, that’s enough said about them. Re #113: Just to add to Gavin’s point, I have never seen anyone proposing such a theory, and for sure I’ve never noticed anyone “railing” against it on RC or anywhere. I have seen a perfectly reasonable statement of the hypothesis that the isthmus closure changed ocean currents in a manner that played a significant role in the transition from the Eocene to the present colder climate regime (noting the absence of a long-term oscillation component along the lines you describe), but why in the world would anyone rail against such an idea? Actually, Steve, the more I thought about my own question the more I began to think about it as you suggest. So maybe I was making too big a deal of it anyway. It seems that it is almost certain that astronomical events/cycles are driving long term climate change, even though we humans temporarily (I mean in a geological sense) may be overriding and/or augmenting the longer term astronomical cycles. So to answer my own cooling question, at some point, even the high CO2 levels that are in the atmosphere at the end of each interglacial cannot compensate for the insolation changes and other feedback. There is also a link to a movie of the four inner planets motions over the last 3 million years. So I still suspect that inclination is somehow involved in longer term climate changes simply because it lines up so well with the glacial cycles. There is not just not a clear causal connection that is apparent between the two. Have you looked at citebase or Google Scholar to see if his ideas have had legs? It’s been a while. Note the timestamp on his “what Greenland looks like today” illustration; I wonder if that view is any different now? Re #s 116/7: A quick look at Muller’s main page seems to support Hank’s supposition. I also found this more recent paper co-authored by Muller that supports obliquity as the dominant factor and doesn’t even mention inclination. As there has been a very large amount of published activity in this field over the last ten years, the apparent absence of follow-on research relating to inclination and the concomitant presence of papers focused on obliquity (and not just by Huybers and his co-authors) as the dominant cycle would seem to tell the tale. Some time with Google Scholar might turn up a review paper from circa five years ago that makes mention of the abandonment of the inclination hypothesis, but in my limited experience with these things very often the only indication of abandonment is a halt to the papers and citations thereof. I should add that whenever I spot an interesting older paper I make a practice of checking through Google Scholar first before posting about it. It saves everyone’s time and minimizes confusion. Re #115: Steve, the papers referenced by William Astley in #94 and #95 (eg. this) make the case that orbital inclination affects cosmic ray flux, which affects climate. Further, contrary to what has been said here on RealClimate, they claim there is a “small but statistically significant” correlation between cosmic rays and climate. They do not say cosmic rays explain most of the warming in the past few decades, in fact they do not tell us the magnitude of the effect. If there is a problem with what these papers are saying, I would like to know what it is. Re: Comment 119. “Orbital inclination affects GCR” How? The 100kyr change in the earth’s orbital inclination is hypothesized to result in a 100kyr periodic significant increase in the earth’s magnetic field. A significantly stronger geomagnetic field would reduce the Galactic Cosmic Ray (GCR) flux. Yamazaki and Oda do not provide a physical explanation for the observed periodic changes in the geomagnetic field, however, using the following hint from their paper and information from another paper (see below) a straw man hypothesis can be created. Also from their paper “secular variations with periodicities longer than the electric diffusion time of the core, which is considered to be about 10,000 years may indicate the presence of external energy sources”. The external energy source could possible be Coronal Mass Ejections or particle acceleration due to magnetic field reconnection (connection of the sun’s magnetic field to the earth’s which accellerates particles.) The sun is more active at higher latitudes. The earth would be exposed to higher latitude areas of the sun when its orbit is inclined. A 100kyr cyclic change in the earth’s magnetic field due to orbital inclination and the subsequent reduction in GCR due to a stronger geomagnetic field is a possible explanation for the 100 kyr eccentricity paradox which is discussed in the next paper. In Muller and MacDonald’s paper “Spectrum of 100-kyr glacial cycle: Orbital Inclination, not eccentricity” they note the interglacial breaks appear at 100-kyr intervals while the orbital eccentricity has a 95kyr and 125 kyr cycle which is a paradox. Also they note insolation changes associated with orbital eccentricity is not sufficient to explain the dramatic warming that ends the glacial period. That is particularly true with the current interglacial as the orbital eccentricity was at at a minimum as compared to other cycles. See this link to their paper for details. Muller and MacDonald, in their paper, hypothesize that galactic dust might cause the climatic change. That hypothesis appears to not be correct. The 100kyr cyclic geomagnetic field which in turn modulates GCR is a possible physical explanation of the paradox. In this paper Raymo notes that the glacial cycles should be affected by precission in addition to obliquity. In addition, Raymo notes the macroclimate is warmest when the obliquity is the greatest, which is contrary to standard insolation explanation of the glacial cycles. Raymo does not have a solution for the noted paradoxes. A possible hypothesis to explain this observation would be that the sun periodically interacts with the earth (an interaction with a periodicity of less than 10,000 years) which creates or maintains the geomagnetic dipole field. A higher obliquity it is hypothesized would result in a stronger geomagnetic field and visa versa. This 41kyr cycle in the geomagnetic field strength is also observed, however, there is currently no physical explanation of why the field is varying periodically. The current climatic models also cannot reproduce the climate from 3 million years ago to 780,000 years ago when the climate followed a 41 kyr cycle as opposed to the current cycle – 100 kyr saw tooth. Does that indicate that the current climate models are not correct? What would be the consequent if the current models missed a key macroclimate forcing function? See comment #120 for details concerning the 41kyr and 100 kyr Paradox. See comment #95 that references the paper “The Glacial Cycles and Cosmic Rays” by Kirby, Mangani and Muller, that proposes that the cosmic ray fux modulated by changes in the earth’s magnetic field and solar changes initiates the main phases of the glacial cycle, in addition to the multitude of semi-periodic rapid change events, rather than insolation changes. Another good paper on GCR is “On climate response to changes in the cosmic ray flux and radiative budget” Published 2005 by the Israel physicist Nir Shaviv.